Abstract design is definitely in the lime light when it comes to home décor, so we thought we’d show you how to introduce this cool trend into your home with the First Edition Wild Flower paper pad. This arty trend works perfectly with the Wild Flower paper designs! Adorned with watercolour marks and brushstrokes in a rich purple, yellow and green tone, this pad will help you create an abstract craft in no time! Read Maxine’s tutorial to find out how to make your own home décor piece. 1. 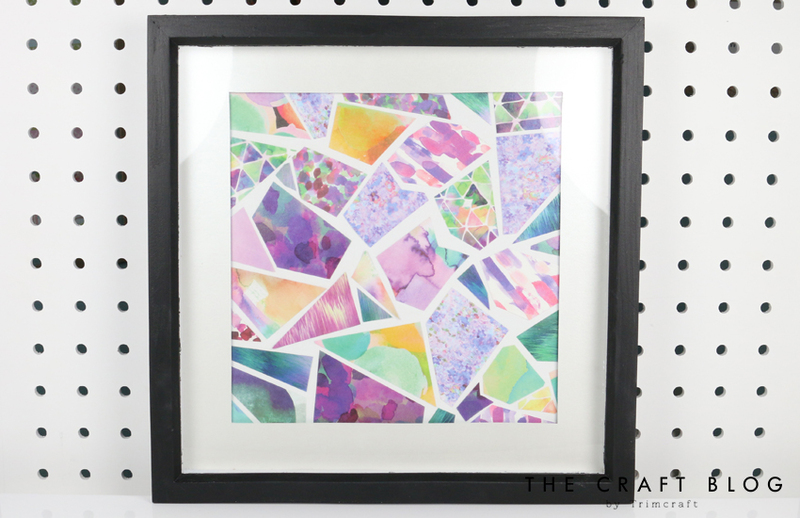 Add Washi Tape to the edge of the glass on your 12x12 frame, to protect the glass from the paint. Use the Deco Art chalkboard paint to paint your frame. You might need two coats of paint to cover your frame. 2. While the frame is drying, take the white side of one of the First Edition Wild Flower 12x12 papers to use as your background. 3. Cut geometric shapes of different Wild Flower paper designs and place them onto the backing paper to create your design, leaving a small gap in between each paper. Tip – Don’t worry too much about the edge as this will be covered with the border. 4. When you are happy with your design, adhere the papers to the backing sheet with Dovecraft Perma Fix Tape. 5. Take one of the pearlescent paper designs from the Wild Flower Paper pad and draw a line around the edge. I made my border the same width as my ruler. 6. Take a craft knife and carefully cut along the line, using the Dovecraft steel edge ruler as a guide. Once cut, flip the border over so that you have the white pearlescent effect at the front. Place this on top of the geometric wall art design. 7. Place your design inside your frame, now it’s ready to hang! This awesome wall art piece looks super professional right? Can you believe it’s so easy to create yourself? You could use different paper designs from other First Edition paper pads to work along with the colour theme in a loved one’s home. You could even add a sentiment in the middle if you made it for a special occasion, although we are a fan of this simplistic, striking design left in its’ natural state! How will you use this geometric wall art design idea? We’d love to see so don’t forget to #trimcraft when uploading to social media and to share your makes in the Inspiration area.